Joe and Sue Davenport display a portion of their collections. Between Joe Daniel Davenport’s 300 fishing lures and his wife Sue’s 70 white oak baskets, the couple could likely share stories enough to cover half the history of Cannon County. 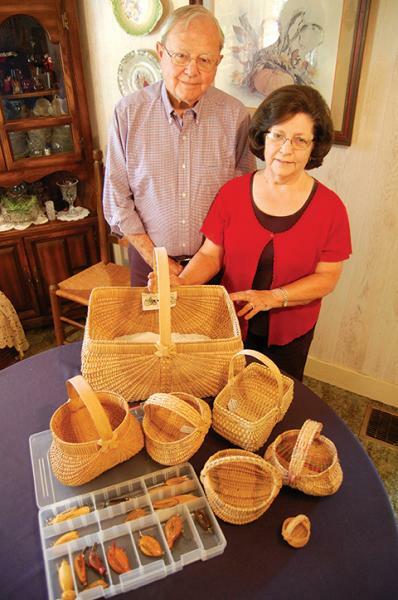 While that may be a slight exaggeration, Sue’s handsome baskets certainly speak for themselves as representations of the handiwork of a half dozen or so Cannon County basket makers reaching back a half century or more. One can easily imagine those hard-working men and women trekking into the wood to cut down just the right size white oak and then hauling the timber home where it was split into hundreds of wood strips before the long hours of intertwining the strips into the marvelous baskets that have made a name for themselves and their makers across the U.S.
As for Joe’s lures, the majority he whittled from small pieces of wood taken from old homes, church buildings, school houses and wood samples used in construction or from branches he found in the woods. They stand in a sentimental way as memorials to sites that time and man have almost forgotten. “I always enjoyed fishing. I began collecting lures in grammar school when I was about 12,” said Joe, whose schoolboy years from the first grade until graduation were spent inside the same Woodbury schoolhouse: Central High and Grammar School. “Dad bought two Heddon Midget River Runts one day at Bank’s Hardware, and I caught a fish on one of ’em in Stones River,” said the son of the late Joe A. Davenport and Pauline Daniel Davenport. In 2000 he took up his knife and began whittling. Twelve years later, Joe Daniel’s hands have turned out about 300 lures, each bearing a date and notation as to where the wood originated. A plastic storage box holds about 15 lures special to his heart, each connected either to his family or the Short Mountain area. The wood in these lures came from such sites as the Mt. Ararat School at Pea Ridge, Wood Cemetery, his Aunt Angie’s kitchen, his Uncle Jim and Aunt Pearl’s house, the Motley House and the Patterson Place. Two more were whittled out of wood from his daddy’s wood box and his grandfather’s barn. He notes that he did not design the lures but copied them from examples he found in catalogs and magazines. “If there was a piece of wood, he usually picked it up to make ’em,” said Sue of her husband’s pursuit carved into cedar, walnut, oak, maple, chestnut, poplar, pine and other woods. “The most time-consuming part was finishing them with three coats of polyurethane,” said the lure maker. It normally took him about two hours to carve a single lure. “I was working on one and hung it in my finger. That was the only sucker I ever caught. I couldn’t do much with it,” he recollects with an easy smile. “I went to see Dr. Spurlock, and he told me, ‘You have ruined a pretty good treble hook.’ He did get the hook out, but I have been cautious from then on. Sue began collecting white oak baskets in the late 1970s. It started when her mother-in-law purchased one at Fred’s Market and gave it to her. “I have always liked the baskets,” said Sue as she named several of the makers of these woodsy Cannon County heirlooms, including Ida Pearl Davis, Gertie Youngblood, Betty Tanner, Elizabeth Thomas and Josie Jones. “I just like things that have a connection to someone that I enjoy or feel close to,” said the native of Watertown in Wilson County, who was a bookkeeper and worked for various employers including Texas Eastern, the Bank of Commerce and Cannon County High School. Sue and Joe met in the early 1960s at Sanders Fork Baptist Church. They married 37 years ago and have a daughter, JoAnna. Joe began his long career at Cannon County High as an English teacher in 1961. He left after one year to test the waters of the insurance business and then returned to the school where he served from 1963 until 2000. From 1980-88 he filled the bill as school superintendent of the county school system. His last 12 years at Cannon High were as history and economics teacher and guidance counselor. Sue and Joe ran a cattle farm off of Sunny Slope Road for many years where they raised registered Angus and then beefalo, but they sold the farm in 2002. The pair became charter members of the Auburntown Historical Society when it was founded in 2006, and Joe has served as president of the Cannon County Historical Society since 2009. Besides his fishing lures, the former educator has their house brimming over with books and more books as he loves reading local and Tennessee history. As for the goal of the local historical association, he says it is “to preserve the history, heritage and lore of Cannon County. There’s a lot of good tales about Cannon County and some of them are true. “We would like to have a museum, and there is a desperate need in Cannon County for an archive. Our Cannon County heritage and history is one fascinating story,” says the man, who, to no small degree, has preserved county history within the wood of his captivating lures.